International cooperation on bank supervision is still rare. This column analyses data on supervisory cooperation among a global sample of countries between 1995 and 2013 to show that cooperation among bank supervisors is not always optimal. Country pairs with higher cross-border externalities and lower heterogeneity are more likely to cooperate, and in more intense ways, but for some country pairs the costs of cooperation outweigh the benefits. When policymakers failed to deal with cross-border bank failures during the Global Crisis, it prompted a rethink of supervisory cooperation between countries (Financial Stability Board 2011). In some cases, this led to closer cooperation. But only about 10% of country pairs have any form of supervisory cooperation agreement among them. There is also significant variation in the willingness of countries to cooperate. Figure 1 shows, for a sample of 93 countries, the proportion of other countries with which they cooperate. Theory suggests that central decision making among otherwise independent jurisdictions should be governed by two factors: externalities and heterogeneity – as for example, in the case of currency union (McKinnon 1963) and fiscal decentralisation (Oates 1962). Beck and Wagner (2016) present a model that applied this trade-off to banking cooperation. Cross-border externalities are a rationale for cooperation. When the policy decision of one country has spillovers to other countries (positive or negative), decentralised policies will be inefficient. For example, without cooperation the negative externalities from banking failures across countries may result in other countries implementing levels of supervision that are inefficient from a global perspective (a 'race to the bottom'). Supranational policies can take into account these spillovers and implement efficient decisions for all countries. Heterogeneity creates cooperation costs. When countries differ in preferences and institutional structures, a common set of policies may not satisfy the preference of either country. It may also be hard to implement. In recent work, we examine whether benefits and costs, as captured by cross-border externalities and heterogeneity, explain the level of cooperation between countries (Beck et al. 2018). This analysis contributes to the rapidly expanding theoretical literature on cross-border cooperation, but also to current policy debates. Now we have single supervisory and resolution mechanisms in the euro area, there are discussions on completing the banking union with a common deposit insurance scheme, on whether non-euro EU members should join the banking union, and on closer cross-border cooperation in other regions of the world (Beck et al. 2014, Schoenmaker 2017). We hand-collected country-pair data on supervisory cooperation among a global sample of countries between 1995 and 2013 from the supervisory bodies' websites, and official documents. Supervisory cooperation can take many different forms and degrees of intensity. In our work we distinguish between four (increasingly intense) forms of cooperation. Least intense would be a memorandum of understanding for information sharing and onsite inspection, then a college of supervisors, then a memorandum of understanding on crisis management and resolution and, most intense, a supranational supervisor. We consider two measures of cooperation. First, we use a dummy variable to indicate that some cooperation was present. We also use an ordinal variable that ranges from zero to four – if there is no cooperation, this is zero; if the countries use a supranational regulator, it is four. Cross-border externalities can arise directly from cross-border activities of banks. They can also arise through fire-sale externalities, informational contagion or panics. Additional externalities may arise in monetary unions where governments might not be able to support their banks and where access to a common lender of last resort might lead to a tragedy of commons problem (Tornell and Westermann 2012). We capture externalities by cross-border banking activities, whether countries share a common global systemically important bank (G-SIB), the correlation of stock market indices, and whether the countries share (or were pegged to) the same currency. Countries with different structures of the banking systems and different levels of economic development face different losses from bank failures. Differences in the political structure of countries (centralised versus federal) can result in higher coordination costs between countries. Geographic, historical, institutional, and linguistic proximity might make cooperation easier. Finally, differences in failure costs might and coordination costs might arise from differences in the role of government across countries. Using data on 93 countries in Europe, Africa, Latin America and Australasia, we examine three dimensions of supervisory cooperation: the probability of cooperation between country pairs, the intensity of cooperation, and the time it took to agree to cooperate. Country pairs with higher cross-border externalities and lower heterogeneity are more likely to have engaged in supervisory cooperation by 2013. The effect is of economic significance. An increase of one standard deviation in the externality index increased the probability of cooperation by 18 percentage points, whereas one standard deviation increase in the heterogeneity index decreased the probability of cooperation by 3 percentage points. These are large effects – the average probability of cooperation was 12% in our sample. Country pairs with higher cross-border externalities and lower heterogeneity agreed cooperation more quickly. The Global Crisis also helped accelerate cross-border cooperation. Country pairs with higher cross-border externalities and lower heterogeneity have been more likely to agree to deeper forms of cooperation. We also study whether the emergence of regional cooperation agreements can be traced back to changes in externalities and heterogeneities. For example, in the EU there has also been an increasing degree of cross-border cooperation since 1990s, which is arguably a consequence of more cross-border banking. The Nordic-Baltic region has started to cooperate more closely following the merger of four large national banks into the Nordea (classified as a global systemically important bank by the FSB in 2011). Finally, Australia and New Zealand have given a legislative backing to their supervisory cooperation. This had become necessary as all large banks in New Zealand are subsidiaries of Australian banks. Specifically, legislation was amended in 2006 to require supervisory authorities, when exercising their prudential regulation powers, to support each other in meeting their statutory responsibilities relating to prudential regulation and financial system stability and, where reasonably practicable, to avoid actions that are likely to have a detrimental effect on the financial system stability of the other country. This is unusual, as most cooperation is based on legally non-binding memoranda of understanding. Our analysis can be used to predict which countries and regions can be expected to move towards closer supervisory cooperation. The banking union in the euro area, which other EU countries have the option of joining, is an example. Figure 2 shows which countries would be the most suitable potential entrants. Bold dots show averages in externality and heterogeneity of a euro area country compared to all other euro area countries, while the crosses plot averages of non-euro area countries compared to all other euro area countries. 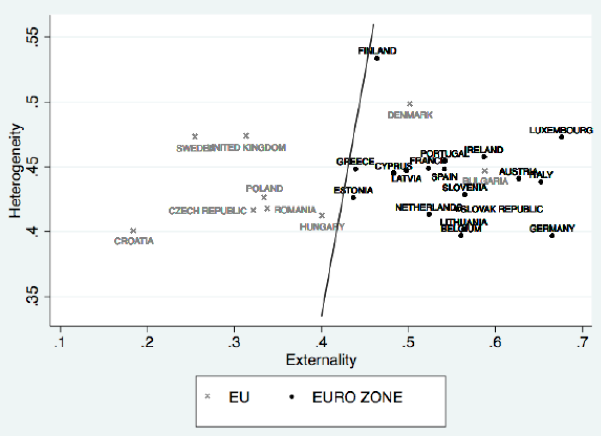 In general, euro area members have much higher externalities than non-euro area EU members. There are exceptions. Among the non-euro countries, Denmark and Bulgaria have similarly high externalities as banking union members. There is also a high variation among banking union members in the degree of heterogeneity, which might explain why achieving even a rudimentary banking union has been such a drawn-out political process. Specifically, Finland shows a high degree of heterogeneity, while Germany, often seen as stumbling block to the completion of the banking union, has the lowest degree of heterogeneity compared to other euro area countries, suggesting that political factors cannot be ignored. Theory suggests that cooperation among bank supervisors is not always optimal. Our empirical analysis supports this hypothesis. Country pairs with higher cross-border externalities from bank failures are more likely to engage in cooperation, and in deeper cooperation. Country pairs for which high heterogeneity imposes a cost on cross-border cooperation are less likely to do so. These findings send important message to policymakers and supervisors trying to mitigate the cost stemming from cross-border banking and financial integration, while harnessing its benefits. Beck, T and W Wagner(2016), "Supranational Supervision: How Much and for Whom? ", VoxEU, 20 July. Beck, T, M Fuchs, D Singer and M Witte (2014), Making Cross-Border Banking Work for Africa, GIZ and World Bank. 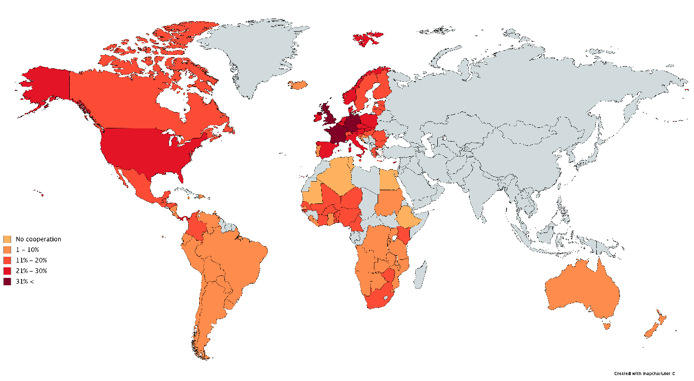 Financial Stability Board (2011), Global adherence to regulatory and supervisory standards on international cooperation and information exchange. McKinnon, R (1963), "Optimum Currency Areas", American Economic Review 53: 717–724. Oates, W (1972), Fiscal Federalism, Harcourt-Brace. Schoenmaker, D (2017) "A Trans-Tasman Banking Union", mimeo. Tornell, A and F Westermann (2012), "The tragedy of the commons at the European Central Bank and the next rescue", VoxEU, 22 June.